- injure themselves or have an accident with vehicle equipment that may still be in operation even after the SmartKey has been removed from the ignition, such as the seat adjustment, steering wheel adjustment or memory function. and to the rear when opened. Therefore, make sure that there is sufficient clearance above and behind the tailgate. To open the tailgate completely, a minimum clearance of 7.20 ft (2.20 m) above the ground is necessary. Vehicles with the EASY-PACK tailgate: if you pull handle 1 and then release it, the tailgate opens automatically. - Pull the tailgate down using recess 1. - Push the tailgate closed from outside the vehicle. button on the SmartKey or with KEYLESS-GO. in the cargo compartment, the tailgate will not lock. You can open the tailgate automatically using the SmartKey or the handle in the tailgate. - When the tailgate is unlocked, pull the handle and let it go again immediately. RPress or pull the remote tailgate opening/ closing switch on the driver's door. RPress the tailgate closing switch. RPress the KEYLESS-GO locking/closing switch. RPull outside handle on the tailgate. You can close the tailgate automatically using the SmartKey, the closing button or the locking button. - To close: press closing button 1 on the tailgate. button on the SmartKey until the tailgate closes. 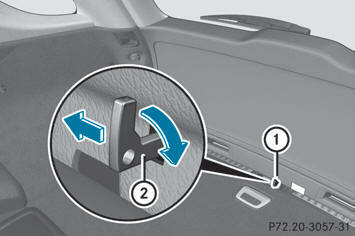 - To close and lock simultaneously: Press locking button 2 on the tailgate. locking the tailgate is only possible if all doors are shut and the SmartKey is located in the vicinity of the tailgate. and closed with the SmartKey if there is no SmartKey in the ignition lock. the cargo compartment, the tailgate will not lock. The tailgate is not closed unless a KEYLESS-GO key is detected. Maintain sight of the area around the rear of the vehicle while operating the tailgate with the door-mounted remote tailgate switch. Monitor the opening procedure carefully to make sure no one is in danger of being injured. To interrupt the opening procedure, press or pull the door-mounted remote tailgate switch. Monitor the closing procedure carefully to make sure no one is in danger of being injured. To interrupt the closing procedure, press or pull the door-mounted remote tailgate switch. - To open: pull remote operating switch 1 for the tailgate until the tailgate opens. - To close: turn the SmartKey to position 1 or 2 in the ignition lock. - Press remote operating switch for tailgate 1 until the tailgate is closed. If the tailgate comes into contact with an object, the closing procedure is interrupted and the tailgate reopens. - To interrupt the closing procedure: push or pull remote operating switch for the tailgate 1. You can limit the opening angle of the tailgate. This is possible in the top half of its opening range, up to approximately 4 in (10 cm) before the stop. clearance to open the tailgate fully when setting the opening angle. The tailgate could otherwise be damaged. Ideally, set the opening angle outside. - To open the tailgate: pull the handle on the tailgate. - To stop the opening procedure at the desired position: press the closing button in the tailgate or pull the handle on the outside of the tailgate again. - To store the position: press and hold the closing button in the tailgate until you hear a short tone. The opening angle limiter is activated. The tailgate will now stop in the stored position when opening. - Press and hold the closing button in the tailgate until you hear two short tones. If the tailgate can no longer be opened from outside the vehicle, use the emergency release on inside of the tailgate. - Take the mechanical key out of the SmartKey. - Insert mechanical key 2 into opening in trim 1. - Turn mechanical key 2 90° clockwise. - Push mechanical key 2 in the direction of the arrow and open the tailgate.